August 2012. A year since we started the first NGPDT treatment (3-9th Aug 2011) at Guangzhou, China. SUVMax reduced from 8.4 to 5.4. See below for chronological order of Petscan and the changes in FDG (Size and SUVMax) of the tumor of Mom. 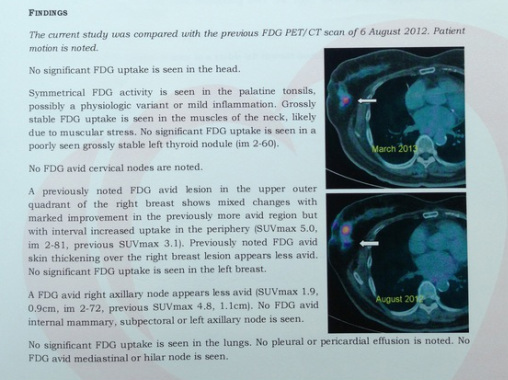 Petscan Report Oct2011: Tumor Increased 2.5cm to 3.3! SUVMax from 6.2 to 8.9!